If you are someone who is broke but wants to read a manga, then you have probably wondered where you can read manga free of charge? Well, we have all probably come to that point, and I have. It all started when I stopped watching anime, and the reason for that is there were no good ones left. Certainly, there are some that exceeded my expectations, and that has forced me into binge-watching a tone of them. One of the latest I have seen was Hunter x Hunter. There came a stop to all of it. I forced myself to move to the manga. So I began to wonder, where can I find good free manga sites? And trust me the ones who rank in the top 10 on the google search are not usually the best ones. It has been an intense search to find these. From different forums to Reddit, trust me I have tried them all. Please do notice that this list is my opinion, and as such the ranking might differentiate for others. If you like anime content follow us on Instagram for daily anime memes and funny videos. MangaDex is an online manga reader and is one of the best places to read manga free and without distraction as there are no ads. You can make your account with greater confidence since they have registered their domain. The website also features a great design giving readers a great experience. Apart from the many manga titles, the website also has numerous Manhwa/Webtoons and Doujinshi titles listed on it. The search interface is very clean and the global search function works amazingly well. Especially since alternative titles for a series are carefully listed down, it is very easy to find the series you are looking for. The website provides the “bookmark” option and you can add tiles to your reading list too. Moreover, MangaDex caters to all languages subjected to availability so you can pick and choose the language as per your liking. Mangadex is made by scanlators for scanlators and it quite evident from the interface. You can follow your favorite scanlators and keep your self-updated on their latest projects. The website gives active groups complete control over their releases. So, if you wish to become a scanlator be sure to check this place out. This also makes MangaDex the top site to download manga free and with a lot of ease. The website hs quickly gained prominence with the website Batoto failing to meet the expectations of the manga readers. Chapters are put up by the official scanlators themselves and due to this quality, I put Batoto on top of my list for free manga sites. Mangakakalot is another website that is now quite popular. The website gives a very nice browsing experience as it can load quickly. It is also completely free and has almost no ads. It has no limitations on the amount of manga you can read. And has a huge amount of manga titles available. There are many reasons why you should read Manga free from here. Firstly, if you are a fan of this format of storytelling style then surely you must read from here. Another reason would be to the money it can save you as you are reading them for free. You can try to read them and then pay for the ones which you have come to love. Anyway, we would always recommend you to support the authors by purchasing the original copies. You do need to sign up for a free account if you are planning on downloading it. One more thing we are certain of is that there is no virus on this site, and it is not some scam site that will hack your computer. Being old and popular certainly has its own benefits. Like many other manga websites, this website also provides the “bookmark” option. 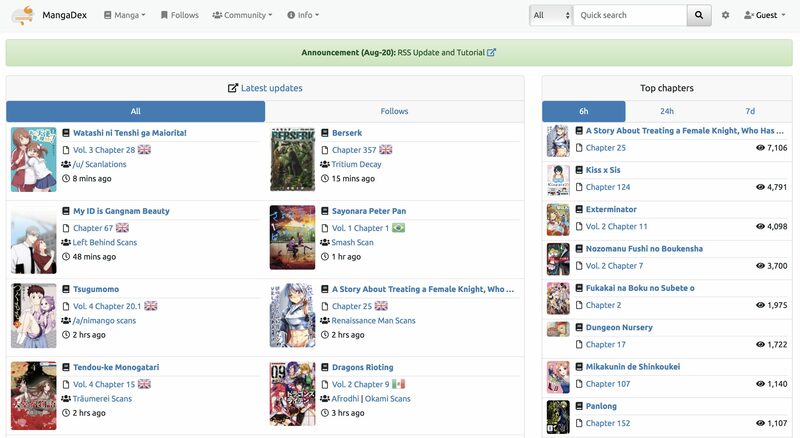 This way you can keep track of the manga you are reading, I enjoy this feature as many other manga sites I used did not have this feature. The website partners with lightnovelgate.com to make a huge list of light novels available for readers. So, if you love to read LN, you can try this website out. 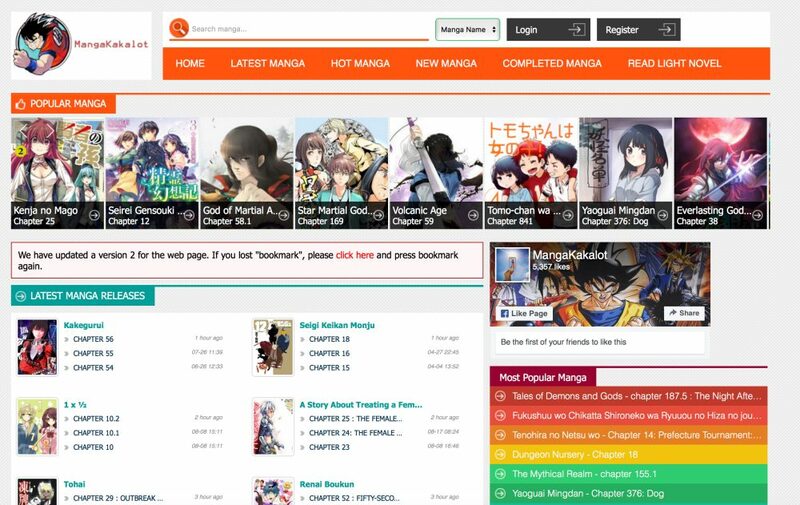 Here is a site that many fans of manga like, and you probably are wondering why. The answer is pretty simple, adult content. Unlike some manga sites, this site has no shame in delivering fresh NSFW for all the horny teenagers. Some may consider this as a con, some as a pro. Personally, I do not care about NSFW as I do not read or watch this type of content. Aside from adult-rated materials this site also provides quality content with fast delivery. The trending content gets updated every day. While this may sound good, although, it is not often that good. Sites like mangahere and other similar, well actually most of the free manga sites do not pay the scanlators one bit. Who are the scanlators? I know we have used this term before in this topic so I’ll explain. Instead of using google-sama I can simply tell you that scanlators are people who translate manga. And most sites like mangafox, mangahere, kissmanga, mangareader and so on, do not pay scanlators and post without their permission. Unlike batoto who work closely with their scanlators. Though if you are thinking that working with scanlators is a good thing then you are wrong. Regardless of the fact that they work a lot to make manga available for English readers. It is still not legal. Though there is one thing you should know. That is that manga panda is stealing manga from mangastream. They simply take the content and put their own watermark over Mangastreams watermark. This is not legal, as any other manga streaming site, but you should not care about that as you are already probably searching for it in an illegal way. Even though it is only in the 5th place, I use this site very often, Batoto and Kissmanga are one of the two sites which I use most often. You already know why Batoto, however, why Kissmanga? It is the same reason I mentioned earlier. They release manga very fast and do not worry about good or bad scanlations. Now while this might seem bad when you want to read quality stuff, it also proves very useful when you are looking for new trending manga. Gotta keep up with the latest chapters. One more reason I prefer Kissmanga and not only that but Kissanime aswell. Is that the navigation is very easy, such as when we are talking about Kissanime compared to Masterani, who certainly has better quality. Navigation is easier due to their latest release widget and top 10 currently airing anime or manga if you are on Kissmanga. This one reason is enough for me to skip over the more popular sites and spend more time on this one. If it only wasn’t for the annoying ads it would be even better. You might also like: Anime Similar to Kiss x Sis, Anime Similar to High School DxD. Now that we have concluded our list of TOP 5 best sites to read manga free, we can move to some honorable mentions. I have one site that is somehow connected to manga and would love to share it with you guys, it is unique and interesting so read on if you got intrigued. Nowdo is a very interesting site. The design of the site that you see after you enter it symbolizes the word elegant and smooth. It is easy on the eyes, has a smooth scroll and explains everything about the site that you need to know. A friend which translates and makes his own manga recommended this site to me. Nowdo welcomes users from every aspect of the world. You can join it and find not only manga but web comics and web novels from all over the world. Most common languages on Nowdo are English, Japanese, Spanish, Korean and Chinese. Nowdo is constantly working on improving their site and making it a better place for their users. Nowdo features an easy to use editor for you to create your web comics, web novels or fan-fics. You simply upload your pictures and add text. You can find much user-made content on nowdo. If you are willing to spend some time searching for good content, then it might actually be worth your effort. Besides the editor nowdo also offers a cool translator, for you to translate already existing content. And if you ever fall into some trouble and do not know what to do you can hop to Nowdos forum. Their forum is a host to thousands of unique users from all over the world. You can share your experiences and learn new things. So if you have some free time I would definitely recommend checking this site out. So after going through this list, you have probably realized that these sites are illegal. Better say, you probably already knew they were all illegal before you even started searching for them. So what’s the difference between illegal sites and legal sites such as Crunchyroll manga.? The first things we should look at are the pros and cons. The pros of the illegal sites are deeply connected to the cons of official manga sites that have licensed manga. You see, for sites like Crunchyroll to include manga they must have a license with the manga publisher/distributor or whoever has the rights to the manga. Due to this on Crunchyroll, you can only find Kodansha series, Shounen Gahousha and Futabasha. Even for people who want to go through legal ways and get manga, this might cause a problem. So if you are in need of a legal manga site I would suggest Mangabox as it is home to the most licensed manga. While that being said we can safely assume that the pro side of illegal sites is vast amounts of manga to read. The pro side can also be considered as the con of it. How come? Well, you see most of these sites have tons of manga because they don’t pay scanlators. No sir, they go and take manga from wherever they can just so they can put them first before others. Aside from Batoto who actually works along scanlators, even though this is also illegal it is not as bad as stealing fully. While both may be illegal I find sites who neglect scanlators wishes much worse. This is definitely the dark side of the manga reading sites, where they rip off others hard work to earn money for themselves. Anime streaming sites are no better than these. So be careful what you pick. In my opinion, it is hard to decide which course to take, whether one should get manga through legal methods or read manga free, well that’s up to you guys now. I hope you have enjoyed the article. I would appreciate it if you would take a moment and give me your feedback for this post in the comment section of this article. Some of the things I’d like to get feedback on is your own personal preferences when it comes to manga sites. Any manga sites you use that I might have missed and you think deserved the spot on that list. Also, your general opinion about this article ‘to read manga free on a website’ would be greatly appreciated. If you are looking for a new interesting manga to read I’d recommend checking out crueler than dead. It’s unfortunate that some manga in the early shounen jump days have been discarded. Can’t even find some of the early ones on any of those sites. I prefer Kissmanga above else,not because of the quality,but the qualities the community can bring up to fascinate my inner interest for mangas and how fast the releases are,even though,most of the translators are always late,making the raw chapters stay in stock for way too long causing several mangas/manhwas/manhuas to be late,causing an uproar in the wait train. Kissmanga is mostly dependent on the scans to be fast in which some are really fast,I mean,most of the shounen Jump mangas have to be,since they are what the community wants the most. Shoujo mangas have the worse kinds of translators though,they make you wait years and years for a possible scan and potential upload,when you can search the actual chapters translated raw in Japan/Korea,and,they will appear to be more. Let me give you an example,there is a manhwa called Soul Land or Combat Continent also in japanese known as Douluo Dalu. I love this first sequence,it was well organized with the fastest releases I could ever hope for. But the thing that becomes dull on how Kissmanga,or should I say,the translator team does it. At first it’s like multiple daily releases,afterwards,a round of single daily updates,then followed up with 3 updates per week,weekly updates were soon to follow,twice per month,monthly,three time per year,two times per year,yearly and boom dropped! Now the example I just gave wasn’t what happened to Soul Land,but to a manhwa called: KuroKami. It followed the exact same process,so that’s one of the things,I really can’t enjoy about it. Another point that I really have grown up to dislike,is,the fact that they refresh the manga comments 3-3 years every time. Now you might be wondering,what is so wrong with that,right? Giving chance for new comments,great tactic. Although,not quite,since in Kiss platforms most of the comments which end up being top comment result in an agreement of opinions indirectly between the users who make an opinion on the manga chapter and the readers. So those comments end up being something that can be admired for several years,and they hold a lot of upvotes. Now,Now,imagine what is like,having around 30 top comments in a manga,with around 3000 or so upvotes,but they decide to refresh,simply just because,rest in peace effort. I believe that once a decade,sure that sounds reasonable,but not 3-3 years please. “V2” or simply just said,version 2,the upload of the same chapter but after a long await time. I wonder in the lands of mysteries why can’t they simply let the chapters stay still and not torture the readers with a false hope that the manga has updated. Outside of Kissmanga,I never really explored anything else,and if I did,I probably already regret it in all kinds of senses. Still a good place to seek interest that can quince my thirst. Release sequels without the prequels being finished to begin with. Not only will the foreshadowing make absolutely and utter non-sense but the fact that the sequel updates more than the original prequel is somewhat a lack of organization and a possible insult to the original story. I remembered why I used Soul Land has an example. The thing is,Soul Land hasn’t finished yet,even though the Light Novel chapters are fully translated and ready to go,while being finished. Aware of that,the people in charge make the stupidest calls like translating the sequels,for example here,Soul Land 2,without the first one even being finished. But oh boy,oh boy,what made me eccentric about it,was the fact that Soul Land 3 got released 10 days after. “Please read the Light Novels instead of reading this horrible pile of trash organization of sequel management”. I,with all my heart,wish they would stop doing this. Aside,from my whining,that was a good article,Hen. aye batoto is a really good site, I think they have scans in other languages too which is great. I prefer read on mangafox. Who even knew there was so much out there for free! thanks for these, It was added to my mind and hope I don’t forget it. Thanks for the information. ^^ I love reading manga. I never tried reading manga, but if somebody over here at TheBiem might make a list of mangas a novice should start with reading, I would gladly give them a try. Gonna show this to my friend since he loves reading manga. Not a big fan of it myself though.